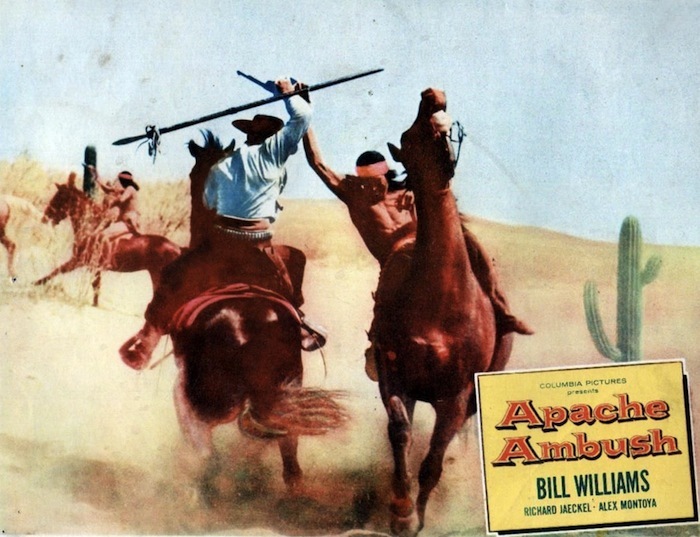 Bill Williams | 50 Westerns From The 50s. Fred F. Sears’ Fury At Gunsight Pass (1956) really knocked me out, and I was eager to move on to his Apache Ambush (1955), again written by David Lang. It opens in Washington, D.C., in April 1865, as Bill Williams, Ray Teal and Don G. Harvey meet with President Lincoln (James Griffith). There are cattle in Texas and hungry people in Kansas, and the president asks the men to drive the cattle north. To this basic cattle drive plot, Lang’s script adds a wagon train, Mexican bandits, the Apaches of the title, a stampede, a bitter Confederate veteran and a shipment of Henry repeating rifles (and let’s not forget Lincoln’s assassination). All of that in less than 70 minutes. Apache Ambush doesn’t rise above its budget the way Fury At Gunsight Pass does. While Fury is tight and focused, Ambush seems to take on too many things. (And it never tops the Griffith/Lincoln opening.) 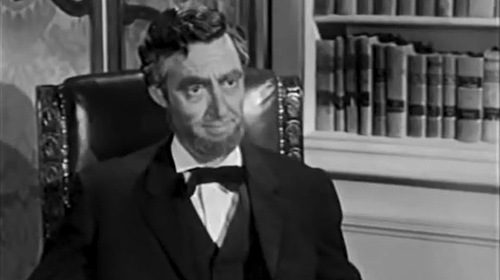 But you are left with the opportunity to spend a little over an hour with a top-notch 50s Western cast and crew. Bill Williams, of course, was Kit Carson on TV. He also appeared in some very good 50s Westerns: The Cariboo Trail (1950), Son Of Paleface (1952), The Halliday Brand (1957) and more. It’s obvious that he’s comfortable on a horse — he and his wife, Barbara Hale, lived on a working ranch. There are a lot of great character actors in the cast, and they all do excellent work, from Ray Teal and James Griffith to old pros like Ray ‘Crash’ Corrigan and Tex Ritter (this was Ritter’s last film). Clayton Moore’s even on hand as a gunman. Adelle August is the good girl (it’s a shame her career was so brief) and Movita (who’d marry Marlon Brando in 1960) is the bad one. Back to Griffith: he was quite good at Lincoln, and played him a number of times. Fred Jackman, Jr., whose cinematography was crucial to the success of Fury At Gunsight Pass, does nice work here, too — though he doesn’t have a sequence as flashy as Fury‘s windstorm. Editor Jerome Thoms had a long career cutting pictures at Columbia. Among his credits are 5 Against The House (1955), Pal Joey (1957), Face Of A Fugitive (1959) and a little thing called Ride Lonesome (1959). In Apache Ambush, Jackman and Thoms do a good job of shooting and cutting to incorporate a lot of stock footage — that may be why it’s black and white — and while it’s all obvious, it matches surprisingly well. Then there’s director Fred F. Sears, who was so good at turning out these things. 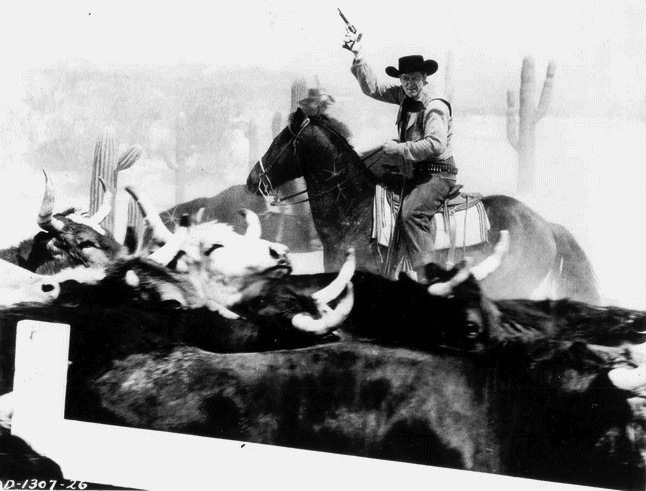 When he had a good script, as with Fury At Gunsight Pass, he turned in a supreme example of what a B picture could be. When he had less to work with, you got a good way to spend an afternoon. And that’s where Apache Ambush winds up — not one of Sears’ (or Lang’s) best efforts, but I’d gladly sit down and watch a dozen more just like it. Apache Ambush is available as part of Columbia’s Choice Collection. I have not seen the DVD-R, but I’ve been told it’s widescreen and looks good. I’d love to see more of Sears’ pictures turn up on DVD. 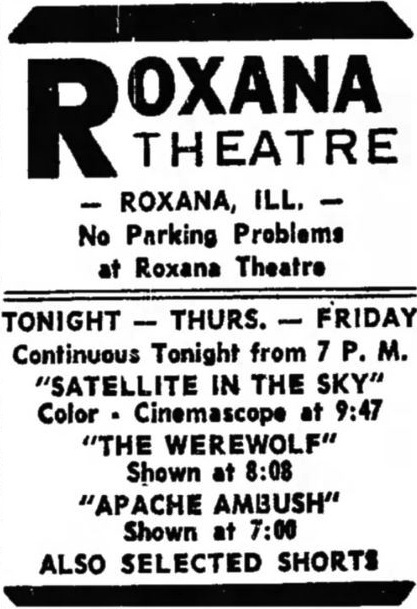 Of course, paired with his The Werewolf (1956) at the Roxana would be fine, too. 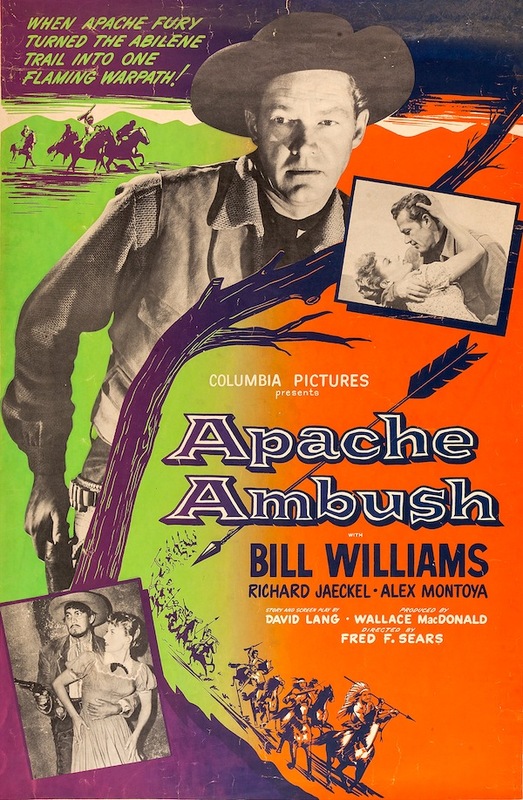 DVR Alert: Apache Ambush (1955). 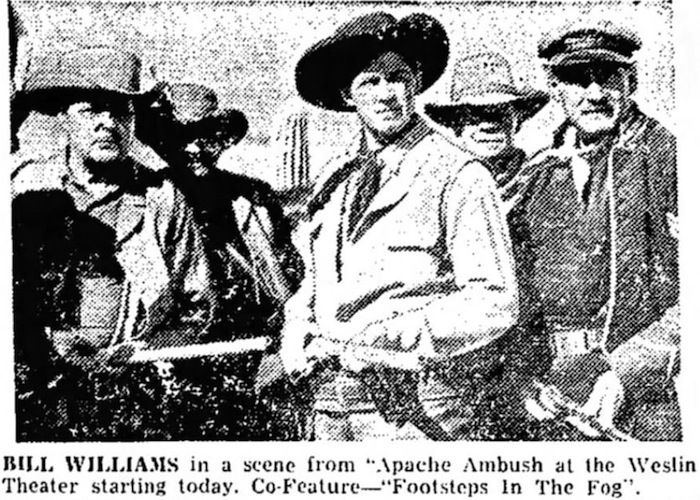 I’m on a bit of a Fred F. Sears kick these days, and I’m preparing a post on his Apache Ambush (1955). Turns out it’s on Encore Westerns this Saturday, February 7 at 10:50AM. Thanks for the tip, Blake.